Paul Lawton, Steve Wilkinson and Phil Pugh at Tynemouth station, their 49th station during the Metro 60 Charity Challenge. Metro stations in North Tyneside are to play host to a marathon one-day fundraising challenge. Three intrepid fundraisers plan to visit all 60 Metro stations to raise money for 11 north east charities. Starting at Newcastle Airport, they will get on and off at each station, before finishing at St James’ around 15 hours later. The Metro 60 Charity Challenge on Tuesday, April 26, is aiming to raise £60,000. 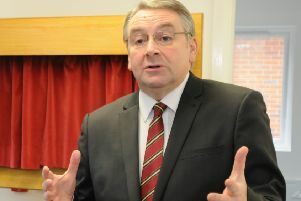 Steve Wilkinson, one of the organisers, said: “Metro 60 is an idea I had a few years ago. Businesses based near each station are being asked whether they want to sponsor a leg of the record-breaking journey. Steve has teamed up with friends Phil Pugh and Paul Lawton. Paul said: “It made sense to help Steve achieve his dream and at the same time assist the good causes we already work with. Paul Walker, customer service director at DB Regio Tyne and Wear, which operates Metro on behalf of Nexus, said: “We hope that Steve, Paul and Phil enjoy their day on Metro and we wish them the very best of luck in their fundraising challenge. The charities benefiting from the challenge are: The Sunshine Fund, 4 Louis, Hope for Kidz, Silverline Memories, Heal and Toe Children’s Charity, Coco, Downs Syndrome North East, NE Autism, Tiny Lives, Off The Rail Kids and Willow Burn Hospice.